Raleigh will celebrate 125 years in the bicycle business in 2012, making them one of oldest and best known bicycle manufacturers on the planet. The 1940’s version of the post-war Raleigh Clubman was a bicycle used for all manner of riding – from multi-day tours to road racing and time trials. Today, the modern Clubman has changed remarkably little. With its current geometry, Reynolds 520 steel frame, and distinct fork shape intact, Raleigh has worked hard over the years to maintain many of the bicycle’s original characteristics, while at the same time combining it with the modern components one would expect in a quality commuter, sport touring, or long-distance bicycle. As its name suggests, the Clubman is an excellent bike for commuting and club rides, but can also be used to handle the demands of short and long-distance bicycle touring. While the retro characteristics of the Clubman may not appeal to everyone, those who appreciate the bike’s classic styling will feel that the Raleigh Clubman not only gets them where they need to go, but does so with some old school speed and fashion. The Clubman is built on a steel frame, which means comfort and flexibility on long-rides, as well as the rigidity and strength that is needed when you load up the bike with a decent amount of gear. The bicycle’s frame also has several steel braze-ons. It’s got a pump peg, chain holder, and the mounts needed for attaching a rear rack. There’s also front and rear fender mounts, two pairs of bottle cage bosses, and a drilled chainstay bridge. Up-to-date components like Shimano’s latest 2×10-speed Tiagra transmission with a 50/34 crank set and 12-30 rear cassette will surely be appreciated for their deft shiftability. While the Clubman can be used for various types of cycling, the most recent models of the bike tend to be more oriented toward speed and racing. However, the Clubman is really an all-rounder, Audax, randonneur, fast tourer, or whatever you want to call it kind of bicycle. It has a 39½”/1,000-and-odd millimeters wheelbase, 72° head angle allied to an almost 2″/50mm fork rake, clearance for 28mm tires and mudguards, with caliper brakes and all the eyelets you could wish for. The bicycle even comes with a Brooks leather saddle! Attaching a rear rack to the Clubman is a breeze, but equipping the bicycle with a front rack is much more difficult, as there are no braze-ons in the front fork for your typical front rack mounting. The Raleigh Clubman does, however, comes with pedals and toe clips, which will fit most people just fine, but will need to be replaced by people with larger shoe sizes. In fact, the pedals and clips, while very much appreciated, are usually replaced in a short amount of time by most serious Clubman owners. Two other items that may soon need replacing are the bicycle’s handlebar tape (which seems to rip and fade rather quickly) and the bicycle’s two tires, which are more suited for local commuting than they are for long-distance touring. Finally, the wheels that come with the bike can handle a fair amount of riding, but they aren’t the highest quality wheels in the world and may need replacing after only a few thousand miles. The suggested retail price of the Raleigh Clubman is about $1,100 USD. You’ll need to contact a Raleigh dealer in your area to test drive, purchase, or special order your new bike. If, however, you can find this bicycle for sale at the end of the touring season, you can usually grab it for a hundred or more dollars less. 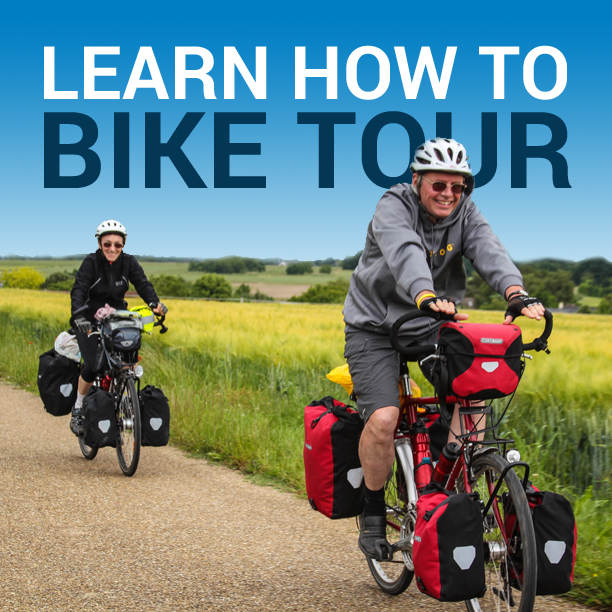 The price of the bicycle, therefore, makes it one of the more affordable lightweight touring bikes on the market. At around 24 pounds the Clubman rides fast and handles like a racing bike, but can put up with the weight you might add to any other touring bicycle. For those who like to ride fast and light, the Clubman is the ideal bicycle. While the gearing isn’t there for strenuous uphill sections, stronger cyclists can usually remain in the seated position until a 16% grade, with anything steeper than that requiring a standing struggle or an embarrassing uphill walk. The Clubman’s steel frame gives the bike some bend, which can be a little nerve-racking at first. However, it is this flex in the frame that soaks up the smaller bumps in the road and provides you with the comfort you need on longer rides. Going down large hills, the bike handles like a dream and is incredibly stable. The Clubman likes to go fast and that is exactly what you can expect to do with it! The best and worst thing about the Raleigh Clubman is the compact Shimano Tiagra 50/34 crank set. You’re likely to develop a love/hate relationship with this choice in gearing. While the high gears are very much appreciated on flat and downhill sections, climbing can be a struggle. But once you reach the top of the pass, you’ll forget all about the pain your just endured and will be glad you’re still riding your Clubman. The Raleigh Clubman is a superbly useful, uber-cool, daily rider which comfortably gets you to your destination with both speed and style. For the price, the Raleigh Clubman might just be the perfect fast commuter. While the bicycle’s components could be a bit stronger, at the end of the day, the Clubman has a superb riding frame with decent parts and enough style to get you a regular admiring glances. The Clubman is a great bike for people who like to travel fast and light and prefer to ride without three main chain-rings. Getting rid of that small ring, however, means that you’ll need to be in good shape to get the most out of the Clubman. And if you aren’t in shape now, you’ll get in good shape after a few weeks on this bicycle. 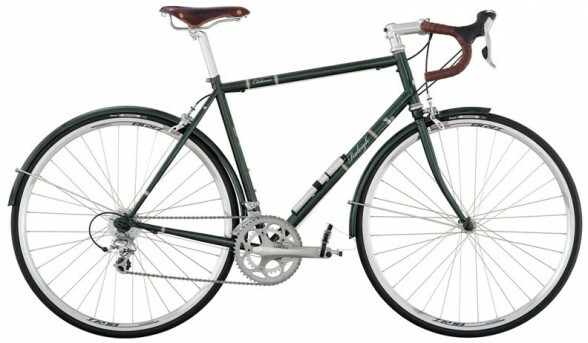 Overall, the Raleigh Clubman is a 7 out of 10 as a touring bicycle and a 9 out of 10 and a daily commuter. About The Author: Jason Cazier works in California and likes to take long vacations to wild places around the world. Jason’s first long-distance bicycle tour was a 2,500 mile ride across New Zealand on a Raleigh Clubman. He is now planning his next bicycle touring adventure. Got a question or comment about this bicycle? Leave a message below and let’s talk some more! This entry was posted in Bicycle Touring Pro Articles, Bicycles, Main Articles, Product & Service Reviews, Products and tagged 2012 raleigh clubman, audax bicycle review, bike club bicycle, club racing bicycle, clubman bicycle, clubman bike, raleigh bikes, raleigh bikes reivew, raleigh clubman, raleigh clubman bicycle review, raleigh clubman review, raleigh clubman touring bicycle, randonee club bicycle. Bought a Clubman about 3 weeks ago and love it! Its super classy looking (unlike the majority of bikes sold these days which are just plain gawdy). I remember when I went to pick it up from the bike shop I ordered it from and they brought it from the back room it was like the whole place stopped and every turned to look at it. A husband whispered to his wife that it was just the kind of bike he wanted. I continue to get asked about it on a nearly daily basis. Its a head turner! Other than its ample good-looks, you are correct about its speedy-ness….the thing really wants to go! I also found that despite it lacking a third, small ring it jets up all but the steepest of hills. Glad to read your review and to find someone the appreciates the subtle nuances of this stately machine. I weigh 296. 6 feet. Is the bike strong enough for one such as I. I love the looks and charm but…..?